Over the past 40 years, the share of young women enrolled in college has more than doubled, while the share of young men enrolled in college has increased much more modestly. In 1967, one-third of young men ages 18-24 were enrolled in college, compared with less than one-in-five (19%) young women in the same age range. The enrollment gap between the two genders declined steadily from the late 1960s through the mid-1980s. Men and women reached parity in the late 1980s. Since then, young women have overtaken young men in college enrollment, creating a “reverse” gender gap where women are more likely than men to go to college. 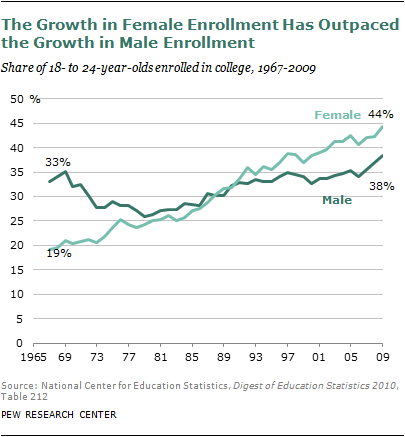 By 2009, a record 44% of young women were enrolled in college, compared with 38% of young men. Young women are not only more likely to be enrolled in college, but are also more likely to graduate from college. 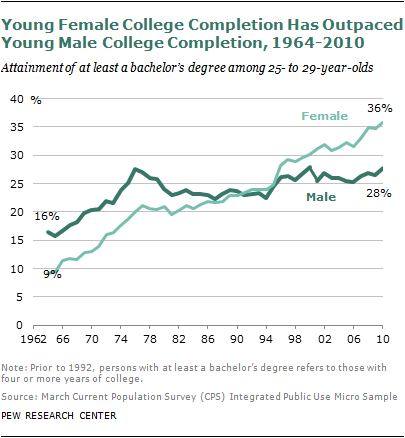 In 2009, among women ages 25-29, 36% had at least a bachelor’s degree, compared with 28% of men in the same age range. The college completion gap between genders is even wider than the enrollment gap: 8 percentage points vs. 6 percentage points. There are significant racial and ethnic differences in college attainment among those ages 25-29. Among the four major racial and ethnic groups, young Asians are the most likely to be college graduates. In 2010, more than half (53%) of Asians ages 25-29 had at least a bachelor’s degree. Young whites have the second-highest completion rate (39%), followed by young blacks (19%) and Hispanics (13%). 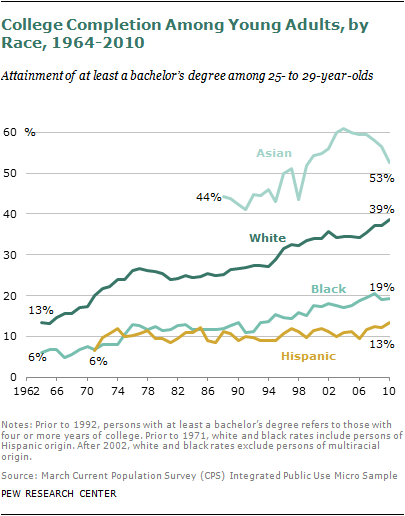 These racial and ethnic patterns have remained stable since 1988 (when data for all four groups first became available), despite the steadily growing share of college graduates within most groups. Another way of looking at the educational gains made by women in recent decades is to consider how the gender distribution of college graduates has changed over time. In 1964, only 37% of college graduates ages 25-29 were women and a majority (63%) were men. By 1987, women and men were on equal footing: half of all college graduates ages 25-29 were women, and half were men. The numbers fluctuated until 1996, when women clearly overtook men. 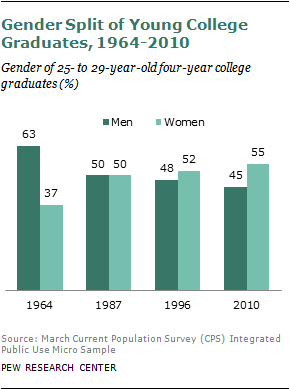 By 2010, the gender split for college graduates ages 25-29 was 55% women vs. 45% men. The gender imbalance in higher education is not equal for all racial groups. Among young black college graduates, men are a relatively small minority. In 2010, only 37% of black college graduates were men and 63% were women. Among white, Hispanic and Asian college graduates, the share of men is close to the average of 45%. The underrepresentation of black men in higher education is not a new phenomenon. In 1988, when the overall gender split was roughly even, there were more black females than black males among college graduates (53% vs. 47%). Today, the gap is much wider. II. How Important Is a College Education?